Do you feel traumatised by a significant event? Do you feel like you should be over it? Do you avoid certain things? 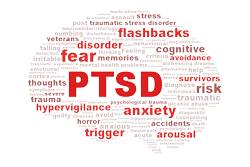 Many people experience a traumatic event in their life. However people can experience very different reactions to the same event. Trauma is a very personal experience. Research shows that a specific trauma focused Cognitive Behavior Therapy is effective in reducing the symptoms of trauma. At Empower Rehab we assess your experience to gain an understanding of the event and your response. We then provide therapy focused on addressing the trauma so that you can move forward and regain control of your life.